If there's one drum we beat repeatedly on Adventures in Breastfeeding, it's about the need of all women to have support on their breastfeeding journey. It is this fact that has led so many women (and some men!) to become Lactivists, putting themselves out in the public sphere to promote breastfeeding, normalize it, and assure all the mothers out there who struggle with nursing that they are not alone. Among the many stories I've found of these remarkable characters, a recent favorite is that of a bonafide princess: Srirasm, Princess of Thailand and Royal Consort of Crown Prince Maha Vajiralongkorn. Princess Srirasm was a commoner who married the heir to the Thai throne in 2001, giving birth to their first (and so far only) child in 2005, Prince Dipangkorn Rasmijoti. Once recovered from the caesarian birth, Srirasm began nursing her son, and was so moved and impressed by the experience that within a few months, she launched an extensive campaign to promote breastfeeding in Thailand. The project, titled "Love and Care from Mother to Children" received the full support of the royal family, including the written endorsement of Srirasm's husband, the Crown Prince. 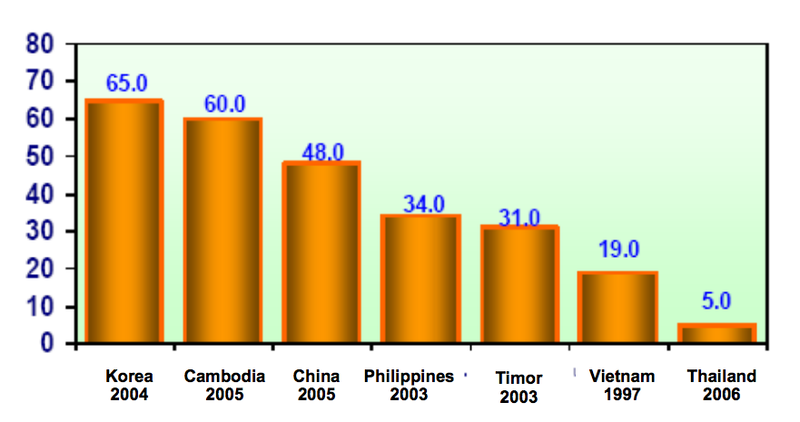 While much of the available data on breastfeeding rates may be inconsistent or unreliable, most sources show Thailand in the 20th Century having the lowest rate of exclusive breastfeeding [for the first six months] in Asia, and among the lowest in the world. Estimates as recent as 1998 had the number hovering just above 2%. Studies blame everything from poor education and diet in rural areas to the growing influence of the formula industry, and cite consequences like higher rates of disease and lower average IQ scores for children. The Ministry of Public Health has made a number of efforts since the 1980s to improve breastfeeding rates, but as of 2006, the number was still a paltry 5%. Enter Princess Srirasm and her adorable little boy. From its inception, the Love and Care project centered around this pair, with interviews, photographs, pamphlets, and posters appearing all over the country, featuring the growing and healthy young prince and his pretty, doting mother. Srirasm was not shy about her experience, answering personal questions about her fears of not producing enough milk, discussing how her own diet could upset the prince's stomach when she ate the famously spicy Thai cuisine, and even sharing just how large a stash of pumped milk she had frozen (50 bags by 4 months)! Aside from the obvious fact that, as royalty, she had access to much better resources than most Thai mothers, she seemed incredibly and wonderfully NORMAL. And IT WORKED. As of 2009, studies now show a rate of exclusive breastfeeding in Thailand of at least 15%, and some put that number at 30% or higher. Though the same problems of methodology and sample size continue to make it difficult to collect reliable data, there is agreement from a wide range of reputable sources that there has been a marked increase in rates of nursing, and these clearly coincide with the active phase of Princess Srirasm's program. The Ministry of Public Health is so encouraged by their success that they have pushed aggressive new policies to attempt to meet reach goals of +50% exclusive breastfeeding by 2025. Of course, not all of us have access to a microphone with national or global reach, but I still find the princess' story inspiring. She used the resources with which she was blessed to reach out to fellow mothers, and she succeeded in making that connection and effecting a change in the culture. Given the well-documented positive health effects of breastfeeding, this could have a direct and powerful impact on the future of Thailand. And if any of you nursing mamas have ever wanted a reason to feel like a princess, well, now you have one! Well done, Your Highness! Missy thanks for sharing this! So cool that she's made such an impact on her country's moms and babies.